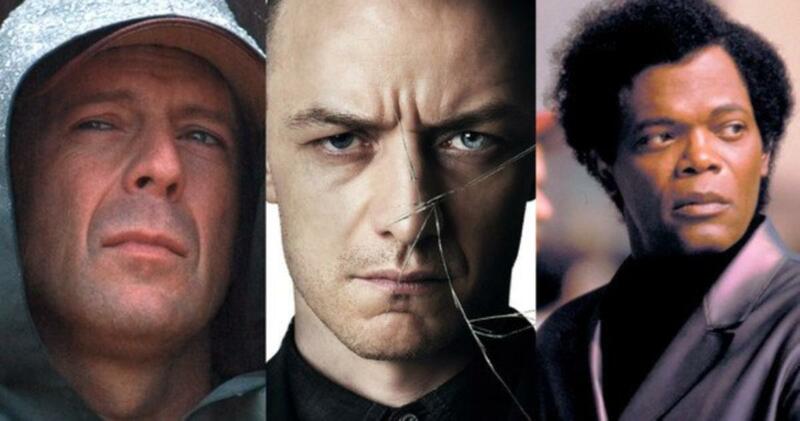 Glass (2019) gives fans of M. Night Shyamalan's Unbreakable (2000) and Split (2016) the chance to see what happens when David, Elijah, and Kevin and his many personalities come together in one hospital and one one screen. It's hard to believe that it's been almost 20 years since Unbreakable captured my attention and heart on screen. I remember vividly watching the first film and being captivated with its storyline. The trailer gave almost nothing away. Yes, there was a time when trailers didn't show all the exciting scenes. All viewers knew is that David Dunn (Bruce Willis) was the sole survivor of a train crash. If you have time, go watch the trailer and see what I mean. Instead of a survivor story though, Unbreakable takes viewers on a journey that includes love, loss, trauma, and man that has been "getting by" for quite some time now because of a moment of significance. He's been surviving long before the train crash happened. David has lost touch with who he is, but not completely. He is drawn to situations where he can guard and protect from a place of shadow. He's a security guard at a local stadium. Through the help of Elijah (Samuel L. Jackson) and his son, Joseph, he realizes he's a supehero. The revelations are drawn with awe, and I remember the power of the soundtrack, too, as things came to a climax. Personally, I'm not that into superhero comics, so that part didn't interest me as much, but I did resonate with the message of connecting with your true calling and the joy and relief David is able to feel, allowing him to reconnect with his wife and son. This is a theme M. Night has portrayed consistently in many of his films: traumatic events causing one to withdraw from life due to shame and fear, and a feeling of awe and wonder when the person is able to overcome the negative feelings to claim their rightful place. Split felt like a very different picture to me. 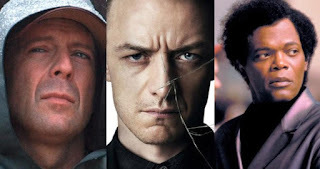 Kevin (James McAvoy), a man with dissociative identity disorder (DID) kidnaps three girls and holds them prisoner in the some sort of basement lair we later learn is connected to the local zoo. In this psychological thriller, Casey is the sole survivor of her ordeal, and even though she is caught by the beast, he lets her go because she is deemed pure of heart, and his qualm is only with the tainted. It's not until the end of the film, when audiences delightfully catch a peek of David Dunn, and we realize it's a tie-in film. I really enjoyed Split, too, but for different reasons. Even though I didn't approve of Kevin's acts, I felt for his pain, and liked the fact that he let Casey go at the end. And the performances of the two leads were impressive, especially from McAvoy. Glass has received some negative reviews, and I can understand why. It's a little long, it has a cheesy ending, and I didn't like the fates of the three leads. The parts I enjoyed were seeing David Dunn and what happened to him and his family since the reveal of Unbreakable. I also appreciated seeing how Casey had processed things since her ordeal. There are some riveting scenes, interesting reveals, moments of funny dialogue, and some tearjerker moments. The ending was unsatisfying but fans of Unbreakable and Split will definitely want to catch this one. You may enjoy seeing my other reviews of M. Night Shyamalan's movies, The Happening, After Earth, and Lady in the Water. Keep in mind, they are a little old. Have you ever felt like you are alone? Like you exist and move around in a community of people that you are nothing like? Imagine how Tina feels. She works as a highly competent border guard for the sole reason that her sense of smell is extrasensory. She can smell fear, shame, and any negative emotion on people as they cross through her security area, and she is never wrong about her suspicions. Her work career, however, might be the only thing she has going for her. She lives on the outskirts of town with a boyfriend that owns a pack of dogs, and from all counts, they live together in a loveless domestic arrangement that is hard to imagine either of them conceiving. Things become a little clearer later as we learn that Tina owns the home and the boyfriend is enjoying the luxury of living rent free. Tina appears to have no family except for the man she calls father, who claims to have adopted her. This is part of my Solo Living: Yes You Can series. Click here to find the intro and all the topics. Solo vacationing can be one of the most freeing and relaxing ways to travel. I'm sure you can think of at least one time when you took a trip only to have your getaway ruined by your companion. I love a good vacation. There's nothing better than taking a few days off to decompress and get away from the stress of life. In my family, even when we didn't have a lot of money, it was considered important to have these little weekends. Sometimes we stayed with a family member. Sometimes, we would drive an hour away to the closest big city and spend a night in the Holiday Inn Holidome (remember those?). We thought that was big stuff. There was an indoor pool and a video game arcade. Sometimes Mom and Dad would go out for dinner, and we three girls would get to order pizza and watch TV ALONE. This is part of my Solo Living: Yes You Can series. Click here to find the intro and all the topics. My journey to buying my first house alone is a long meandering one, but it's worth telling and makes me proud that I was finally able to take the jump. Buying a house is one of those things that can seem daunting and impossible. The first step you have to overcome is just overcoming the negative thought in your mind that it's impossible. Once that bridge is crossed, it's really just a matter of putting the pieces into place. Often to reach this place, you have to reach a pain point where your current situation is so heinous and unbearable that the pain and struggle of buying a house seems the lesser of the two evils. You might think of this as the tipping point, or the point of no return. It's the point where going back is harder than moving forward.